For a thousand years, from AD37 to AD1054-66, the people living in the British Isles and western Europe believed and worshipped God as an integral part of the undivided Orthodox Catholic Church. That Church was governed world wide by five Patriarchs, those of Constantinople (the Ecumenical Patriarch), Rome, Jerusalem, Antioch and Alexandria. The Church in the British Isles was a local expression of the common Orthodox Christian Faith held throughout the world. The great saints of the British Isles such as Saint Aidan, Saint David, Saint Patrick, Saint Alban, Saint Chad, Saint Cuthbert, Saint Boniface, Saint Dunstan etc., were all members of that Orthodox Catholic Church in the British Isles which continued for a thousand years. The initial split in the world wide Church occurred just after the beginning of the second millennium, when the Patriarch of Rome and his people parted from the majority of the Church led by the Ecumenical Patriarch and the other three Patriarchs. Throughout the second millennium, the church adhering to the Pope (Patriarch) of Rome, continued to split and further split until today there are some ten thousand separate groups or churches. The original Church, the undivided Orthodox Catholic Church, continues today, still led by the Ecumenical Patriarch of Constantinople and the Patriarchs of Antioch, Jerusalem and Alexandria, joined by the Patriarchs of Moscow, Georgia, Belgrade and Bucharest. During the past millennium, the Church has expanded, with Russia and the Slavic Churches having the largest number of Orthodox people in the world today. The Church founded by Christ and spread by His Apostles and Evangelists – the Orthodox Church – numbers hundreds of millions of members today, and is rapidly expanding on all the continents and especially in the western countries. We know that the Galatian and other Celts throughout the Celtic crescent from Galatia to Britain had a prophecy that at the end of their five hundred year period, a great king would be born over the earth. We also know that the Galatian Celts had Druids who were famed through the middle east as Magi and were often employed in royal courts as Wise Men (Astrologers). It is considered likely that the Wise Men of the New Testament who attended Jesus after His birth were such who were ready for a great king to appear since their prophecy period ended at that time. Robert Molnar of Rutgers University found that Jupiter had two eclipses by the Moon in 6 BC. The second eclipse on April 17 th coincided precisely when Jupiter was in the east, which is mentioned twice in the Biblical account about the Star of Bethlehem. In August of that year Jupiter became stationary and then “went before” and became stationary again on December 19th, 6 BC. This is when the planet “stood over.” – also described in the Bible. The terms ‘went before’ and ‘stood over’ refer to the retrograde motion of a planet and its stationing in the constellations. Once the Three Wise Men realised what was happening, they had more than enough time to mount a caravan and travel to Israel over the course of the following several months. Jesus was born in the spring when sheep were having their lambs and shepherds were therefore watching through the night because these were the walled Temple sheepyards and these sheep were valuable. This tells us several things. Firstly from Biblical prophecies: The prophet Micah 4:8 states, “And thou, O tower of the flock (Migdal Edar), the strong hold of the daughter of Zion, unto thee shall it come, even the first dominion; the kingdom shall come to the daughter of Jerusalem.” The “Tower of the Flock” Migdal Edar, was the designation of an actual tower. The Old Testament clearly states that the Messiah was to be born at the “watch tower of the flock” this was both the place to guard the sheep and the place where ewes brought forth their lambs, it is the most likely place of Jesus’ birth – not a stable but as the Septuagint says a “stall” a different thing altogether – a place where the sacrificial lambs were born – and precisely the place where the prophet said He would be born. If the star “stood over” Jesus as the astronomers think, on the 19th of December – and as the Wise Men had travelled (as we think) from as far as Persia, the journey would have taken months, so December the 19th is fitting. The Matthaen account does not mention the name of the town where the Wise Men came to Jesus – only that they found Him in an house. So we have a fairly widely accepted date for Jesus’ birth – in the spring – April of 6 BC. Jesus went to Tyre probably in AD 32 as recorded in Mark. And it was there that Jesus really dealt not with Jews – but with non-Jews, performed at least one recorded miracle (although the feeding of the Five Thousand was also non-Jews). Some modern investigation thinks that the Crucifixion may be dated as April 3rd, 33AD because of the earthquake recorded in the Gospel and the fact that they can date an actual earthquake in the region to that date. Saint Stephen was stoned in late AD 34 or early AD 35 at the latest. Since Saul (Paul) was standing there at Stephen’s death and taking part in it, his conversion may at best be put around AD 36 – 37. We know that he spent possibly some months in Damascus and then went to Arabia for two and a half- to-three years, which means that he did not become active until at least AD 40 to 42. So we have now some idea of the actual timeline of events from the birth of Jesus to the beginning of the Church in the British Isles – which demonstrably preceded the establishment of the Churches of Rome and Greece. The terms “England”, “Wales” and “Scotland” are used here for convenience as geographical indicators, since for most of the first millennium, they did not exist as such. AD 37: Saint Aristibule sent to Britain from Tyre as first Bishop – recorded by Saint Dorotheus, Bishop of Tyre. This was six years before the Roman Empire invaded Britain. In those days his most likely point of entry would be Devon or Cornwall. The four synods of Pisa 1409, Constance 1417, Sienna 1424 and Basle 1434, mention that “the Churches of France and Spain must yield in points of antiquity and precedence to that of Britain as the latter Church was founded by Joseph of Arimathea immediately after the passion of Christ.” It is possible that these references are to Saint Joseph of Arimathea having financed Saint Aristibule and probably having accompanied him. 160: Saint Dyfan (often Latinised as Damian) and Saint Fagan (often Latinised as Fugatius) were brought by Saint Lucan a local king to re-organise and extend the Church in the west of England/Wales. 160-180: Bishop Saint Elvan and Saint Mydwyn are recorded in the Church in the West of England/Wales. Bishop Elvan died at Glastonbury circa AD195. 180c: Saint Dyfan becomes the first Christian Martyr of the British Isles (and hence the name of the town of Merthyr Dyfan just south of Cardiff in Wales). 208: The Roman historian Tertullian, in a tract mentions the Church in Britain as having reached parts as yet unconquered by the Roman Army, which tells us that the Church had developed beyond the Roman pale and was certainly indigenous, as the actions of Saint Lucan clearly show. 238: Origen makes mention the Church in Britain. 306: Constantine the Great was proclaimed as Augustus – ruler of the Roman Empire – at York in northern England. 314: Archbishop Adelfius of Caerleon, the Primate of the Local Church in Britain, the Bishop of Eborius (York), Bishop Restitutus of London and a large retinue attended the Council of Arles. 325: Saint Athanasius specifically states that the British Church recorded her agreement to the decisions of the First Ecumenical Council held at Nicaea. 397: Saint Ninian founded the monastery at Whitehorn in Galloway. 399c: Saint John Chrysostom attests to the British Church as integral with the rest of the Church and holding the same faith. 432: Saint Patrick, born in the west of England, was consecrated Bishop and took up residence in Ireland. He ruled as Abbot-Bishop of Armagh for the next thirty years, founding many monasteries and extending the Church in Ireland until the time of his death in 464. 447: Visit of Saint Germanus accompanied by Severus, Bishop of Trier, to Britain. 456c: Caldey Abbey in Wales founded on Caldey Island. 478: Llantwit Monastery founded by St. Illtyd. By 530 it had in excess of 1,000 monks. 500c: Bangor Iscoed Monastery founded by Saint Dieniol. 500: Llanelwy Monastery founded by Saint Kentigern. By 570 it had over 1,000 monks. 520c: LLancarvan Abbey (“the house of saints”) founded by Saint Cadoc. 521: Saint Samson is consecrated bishop by Saint Dyfrig, Archbishop of Glywysing and Gwent, the Primate of the Local Church of Britain. 525c: The monastery at Padstow, Cornwall, founded by Saint Petroc +564. 525: Saint Samson founded the Monastery of Dol and became its first Abbot. 545: The Synod of Brefi is held at Llandewi Brefi to condemn the Pelagian heresy. 545: Saint Dyfrig, Primate and Archbishop of Caerleon resigned his position in favour of Saint David. 545-6: Saint David moved the Archdiocese from Caerleon to Menevia (St. Davids). Death of Saint Dyfrig. He was succeeded as Bishop of Glywysing and Gwent by Saint Teilo. 547-48c Saint David, Archbishop of Menevia (Wales) Primate of the Church in the British Isles, did obeisance to the Patriarch of Jerusalem (as did his successors Saint Padarn, Bishop of Avranches and Saint Teilo later Archbishop of Menevia). Saint David reposed in 601. By the midst of the first millennium, the Church in the British Isles boasted a chain of hundreds of monasteries great and small, anchorite cells etc., spread all over the land. The Diocese was typically centred on the monastery in which the Abbot-Bishop lived and from which he ruled his Diocese, sometimes using monastic clergy to service the closer dependent Parishes and married clergy in the further towns and villages. There is reason to believe that secular as well as the numerous monastic Celtic Priests wore plain, equal-armed pectoral Crosses although whether this was universal or by rank is uncertain. Monks of the early period are believed to have worn plain, unbleached, heavy, coarse woven woollen habits with a full hood and leather belt. They habitually carried a plain staff. Secular clergy are believed to have worn black or dark blue cassocks. Later monks wore a darker habit and retained the staff. 553: Saint Kentigern Garthwys founded Glasgow Cathedral, adjoining a Christian cemetery established by Saint Ninian. 563: Saint Columcille travelled with some monks to Iona in Scotland where he founded the famous monastery at Iona on an island off the Atlantic coast. 564: Saint Cadog settled in Weedon in Calchfynedd and was made Bishop there. Saint. Samson attended the Council of Paris and witnesses several Royal decrees. 569: Saint David called the Synod of Victoria to denounce the Pelagian heresy once more. 570: Death of Saint Gildas at Llantokay (Street). He is buried at Glastonbury Abbey. 584: Death of Saint Deiniol Gwyn, Bishop of Bangor Fawr. 588: Skellig Michael Monastery founded by Saint Finnan on a rock 600 ft above the Atlantic Ocean seven miles off the west coast of Ireland. Probably one of the most inaccessible and austere monastic communities in the world, it flourished for a thousand years, at the end, being disbanded because the monks refused to accept the new calendar. 589: Death of Saint Constantine the King of Dumnonia (Devon). The Church in the British Isles at this time numbered 120 bishops, hundreds of monasteries and parishes. It is well organised under a Primate with his See at Menevia, having been in existence since AD 37 – 561 years. 597: The monk-bishop Augustine sent by the pope to invade the British Church lands in Kent and meets Bishop Luidhard, chaplain to the Christian queen of the pagan Saxon king. Instead of leaving, he invades the lands properly belonging to the Local British Church. 598: Canterbury Abbey founded, Glastonbury Abbey founded. 601: The Synod of Chester. Death of Saint Asaph, Bishop of Llanelwy. 602: Augustine of Canterbury met with the British Bishops at Aust near Chepstow. He failed to acknowledge their Local Church and insisted that they yield to him in the conversion of the Saxons, and look to Canterbury as their spiritual centre. The British bishops tactfully declined. 604: The British Bishops met for a second time with Augustine of Canterbury. He neglected to rise to greet them, lectured them again and insisted they submit to him. The British Bishops sent him packing. They refused to recognise the authority of a church within their enemies’ territory under such a disrespectful bishop. 634: Saint Aidan, at King Oswald’s invitation, came from the Monastery at Iona, to set up his See at Lindisfarne, as Bishop of all of Northumbria. Here he founded his monastery, staffed by a group of monks who had accompanied him from Iona. 635: Saint Aidan founded Whitby Abbey in Yorkshire. 664: The Synod of Whitby held to reconcile the dating of Easter with that of the universal Church. 669: Saint Theodore of Tarsus, a Greek monk appointed to the See of Canterbury, arrived in at the age of 67 and began a twenty year episcopate of trying to persuade the British Bishops to accept him as Archbishop. our Faith, preserving inviolate the decrees and definitions of our holy and respected Fathers.” I then proceeded to speak at length on the need for charity, and the preservation of the Church’s unity. And having concluded my discourse, I asked each in turn whether they agreed to observe all the canonical decrees of the ancient Fathers. To which all our fellow-priests replied: “We agree gladly, and we will readily and willingly obey whatever is laid down in the canons of the holy Fathers.” I then produced the said book of canons, and publicly showed them ten chapters which I had marked in certain places, because I knew them to be of the greatest importance to us, and I asked that all should devote careful attention to them. * Chapter 5. “That no clergy shall leave their own bishop and wander about at will, nor be received anywhere without letters of commendation from their own bishop. And should such a person, once received, refuse to return when so directed, both receiver and received shall incur excommunication. * Chapter 9. It was generally determined, “That more bishops shall be consecrated as the number of the faithful increases.” But we shall take no action in the matter for the present. The second Synod at Hatfield produced a statement of orthodoxy regarding the monothelite controversy. 673: Ely Abbey founded by Saint Etheldreda. 674: The great Monastery at Wearmouth, Northumbria founded. 674: Hexham Abbey founded by Saint Wilfrid. Schism and thereafter until the reformation. 690c: The Witenagamot – the Parliament of England – forbade appeals from the Local Church to the Patriarch of Rome, emphasising the sufficiency of the Local Church and its Primate. 693: Death of Bishop Eorcenwald of London. He is buried in Saint Paul’s Cathedral, London and later revered as a saint. 700: Saint Aldhelm, Abbot of Malmesbury, attended a Synod in Wessex, from which he sent King Gerren of Dumnonia a letter insisting that his kingdom’s Church comply with the practices agreed thirty-six years previously at the Synod of Whitby. 700: Evesham Abbey founded by Saint Egwin, Bishop of Worcester. 704: King Aethelred I retired to the Abbey of Bardney as a monk. 706: Archbishop Bertwald of Canterbury called the Synod of the Nidd which officially recognised Saint Wilfred as Bishop of Hexham and Abbot of Ripon. Saint John of Beverley, the previous Bishop, was transferred to York. 709 King Cenred of Mercia entered a monastery. 713: Queen Cuthburh of Northumbria founds Wimborne Abbey. 716: Croyland Abbey built on the site of Saint Guthlac’s hermitage. 720: King Ine of Wessex builds a substantial church at Glastonbury. 731: Saint Bede completed his history of the Church in England. 747 The western ecclesiastical calendar was adopted in England by a Synod meeting in Cloveshoe. In addition, observance of the feast days of Sts. Gregory the Great and Augustine (of Canterbury) was ordered. The English Church made unilateral changes to her calendar until 1161. The Rogation days were adopted. 747: The Witenagamot again forbade appeals to the Roman Patriarch. In both cases, ecclesiastical appeals could go only as far as the Archbishop of Canterbury as Primate of the Local Church. 754-56: The forged “Donation of Constantine” purported to grant the pope of Rome supreme power over the other Patriarchates and to make him the supreme ruler of the universal Church. 768: Archbishop Elfoddw of Gwynedd persuades the Welsh Church to accept the results of the Synod of Whitby. Regarding vestments of the British Church of the first millennium, perhaps the best example to cite is the set which have survived intact at Durham Cathedral. The stole bears an embroidered inscription which states that the set was made at the order of Queen Elflaed who died in 916, for Bishop Frithstan who held the See of Winchester from 909 to 931. The stole has embroidered on it the figures of sixteen prophets, with Saint Thomas and Saint James at either end, the whole very richly decorated. The matching maniple has the figures of Saint Gregory the Great, Sixtus II Saint Lawrence and Saint Peter, with Saint John the Baptist and Saint John the Divine at either end. Saint Cuthbert wore an equal-armed gold pectoral Cross decorated with garnet rectangles and a central circular garnet. It had no figure, a feature which is extremely common among pectoral Crosses of the period. The T headed crozier was used by bishops of the first millennium as well as the crook-headed crozier. 785: The Synod of Cealchythe erects the Archbishopric of Lichfield at the request of King Offa. 792: The Synod of Regensburg condemned Adoptionism. 796: King Offa of all England signs a commercial treaty with his younger European contemporary, the Emperor Charlemagne dealing with him as an equal, while Charlemagne is recorded as having regarded him as an outstanding ruler. 800: Pope Leo III crowned Charlemagne as “Roman Emperor” thus asserting his claim to the West, as presented in the forged “Donation of Constantine”. From this time the term “pope” began to be exclusively used for the Bishop of Rome. 800c: The Western Rite Monastery of Saint Mary was established in Jerusalem. A description circa 870 of the monastery is extant. 801: The monks in Jerusalem shocked by Frankish visitors sent by Charlemagne, who used the filioque. 803: The Synod of Cloveshoe made some decisions purporting to effect the whole Church in the British Isles. Introducing the Gregorian Canon into the Liturgy of Saint John, suppressing the Archbishopric of Lichfield. 804: Alcuin wrote to the people of Lyons cautioning them not to insert the filioque into the creed. The exiled Spanish bishop Felix was there advocating its use. 810: Pope Leo III refused permission for the filioque to be inserted in the Creed, saying that he could not override the Councils and the Fathers. 850: Bishop Censteg of Dingerein (Cerniw) accepted the authority of Archbishop Ceolnoth of Canterbury. 860: SS Cyril and Methodios arrived in Moravia and began their mission using the Western Liturgy there. They essentially used a Western (Latin) liturgy translated into Slavonic in Dalmatia. 867: A synod met at Constantinople. It anathematised the doctrine of the Procession of the Spirit from the Father and the Son (filioque) and the practice of clerical celibacy. 871: Alfred the Great, a warrior and scholar, became King of the West Saxons and most of modern England. accepted the council’s teaching that no one should add to the creed and in a letter to Patriatrch Photios indicated that he believed the filioque to be false. The filioque was not used in Rome until 1014. 893: Asser, a cousin of Nobis, Archbishop of Menevia and literary expert at King Alfred’s court, was made Bishop of Sherborne (+909). 909: William of Aquitaine founded the monastery at Cluny. 944: The Western Rite Monastery of the Holy Saviour was established in Constantinople under imperial favour. 980-985: The Western Rite Benedictine Monastery of Amalfion was founded on Mount Athos by the first Abbot Leo. Abbot Leo and his monks initially dwelt at the Great Lavra of Saint Athanasius while Amalfion was being built. The two monasteries remained closely linked. Abbot John III of Monte Casino dwelt there at the time of Abbot John of Amalfion (circa 993). The monastery and its abbot were among the five senior (oldest established) – recorded on many still extant documents. It flourished under imperial favour until 1287. This is of note because the monastery remained in imperial favour after the Schism in 1054 and after the Sack of Constantinople in 1204, was given further land grants. 988/9: The conversion of Russia. Vladimir of Kiev (son of Svyatoslav and known as Vladimir Ravnoapostolny, “equal to the Apostles”) was Baptised and married to the Roman (Byzantine) princess Anna, the sister of the Byzantine Emperor Basil II. Mass Baptisms followed Vladimir’s Baptism. Vladimir later established bishoprics at Novgorod and Belgorod and a seminary at Kiev for the instruction of local clergy. The British Church had been Orthodox for 950 years at this time. southern Italy, or in northern Europe to the Baltic coast. 1059: The papacy forged an alliance with the Normans against the German emperor (Henry IV, 1056-1106). At the Investiture of Melphi, Pope Nicholas II (1059-61) presented Capua to the Normans Richard of Aversa and Calabria, Apulia, and Sicily to Robert Guiscard. In return, the Normans swore allegiance to the papacy. it 70 yards from where they had left it, and completed by unknown hands. Thus began the Shrine of our Lady of Walsingham as a place of pilgrimage. It presently has two Orthodox chapels and an Orthodox Monastery. 1066: The Norman Conquest of England. William of Normandy’s invasion was instigated and supported by the papacy, which had quarreled with King Harold Godwinson. The pope sent William the banner of St. Peter and funds for the conquest on condition that the bishops and abbots of the English Church be replaced with papal bishops and abbots. In William’s newly conquered kingdom the monasteries controlled one-sixth of the kingdom’s revenues. The widow and sons of the last Orthodox King of England, Harold Godwinson, fled to Orthodox Kiev, where she married Prince Golytsin. The British Church claimed its Divine Liturgy as originating in Ephesus at the time of Saint John’s residence there. Accordingly they referred to it as “the Liturgy of Saint John” (the Theologian). Belonging to the Gallican family of Liturgies, it developed alone in the British Isles for four centuries. After that it began noticeable cross borrowing from other liturgies including as far away as Rome. The Liturgy is best preserved in a book which began its life around AD 600 and ceased having additions and alterations made to it about 950. This Liturgy continued in use in parts of the British Isles until 1171 when the schismatic papal bishops introduced into the British Church in 1066 had it suppressed. It was the basis for the Sarum Liturgy which was used from circa 1220 until after the Henrician split between the English church and the Roman church. It was used thereafter in England by the remnant Roman Catholics until the late nineteenth century, when the 1570 Tridentine rite was enforced. It continued in use in a few Anglican monasteries until the mid twentieth century. It is presently used by the ROCOR Saint Petroc Monastery and its missions. The rite, seems to have evolved from the original Liturgy brought to the British Church from Ephesus early in the first millennium, has remained in active use ever since. It is therefore of very ancient lineage. Its predecessor the Liturgy of Saint John the Divine is used in two monasteries in the Russian Orthodox Diocese of Belgium and the ROCOR Hermitage in Scotland. 1066 – 1171, the Church in the British Isles came under complete control of the Norman, Papal bishops and was therefore involuntarily included in the schismatic papal church. 1860s Dr. J.J. Overbeck held lengthy conversations with ROC authorities regarding the blessing of the Western Rite for use within Orthodoxy. 1868: The Primus of Scotland visited Russia, where he held informal discussions with Metropolitan Filaret of Moscow and other Russian Church leaders about their interest in effecting the admittance of the British Church into Orthodoxy. He reported his meetings in detail to the Archbishop of Canterbury and the Convocation of Canterbury. 1869: In September of this year, the Holy Synod of Russia authorised the use of the corrected text of the Western Rite Liturgy (the Liturgy of Saint Gregory) and Benedictine offices for use in England. This was the text of the pre-Tridentine Roman Liturgy. 1870-71: The Old Catholic Schism occured after the “reforms” of the First Vatican Council imposed papal infallibility. The Russian Church openly courted Old Catholics in France and Germany. 1879: In August of this year, Dr. J. J. Overbeck went to Constantinople to request their approval to use the Latin liturgy and Benedictine offices. 1882: The Patriarch and Synod of Constantinople gave conditional approval to the use of the Latin liturgy and Benedictine office. 1890/1891: Bishop Vladimir (Sokolovsky) Russian Orthodox Bishop of Alaska, formally received a parish of Swiss Old Catholics at Dyckesville, near Fond du Lac, Wisconsin, as a Western Rite parish. 1892: Bishop Nicholas (Ziorov) successor to Bishop Vladimir made a pastoral visit to the Dyckesville/Fond du Lac Western Rite parish. 1898: The Western Rite Diocese of Moravia and Silesia was organised in Czechoslovakia under the Holy Synod of Russia. 1904: Archbishop Saint Tikhon (Belavin) and Bishop Saint Raphael (Hawaweeny) assisted by Fr. Saint John (Kochuroff) petitioned the Holy Synod of Russia to permit the adaption of the services taken from from the Book of Common Prayer, for use by Orthodox people. 1907: The Commission of the Holy Synod of Russia reported in favour of adaption of the services taken from the Book of Common Prayer and set out the criteria for adaption. The Holy Synod adopted the report. 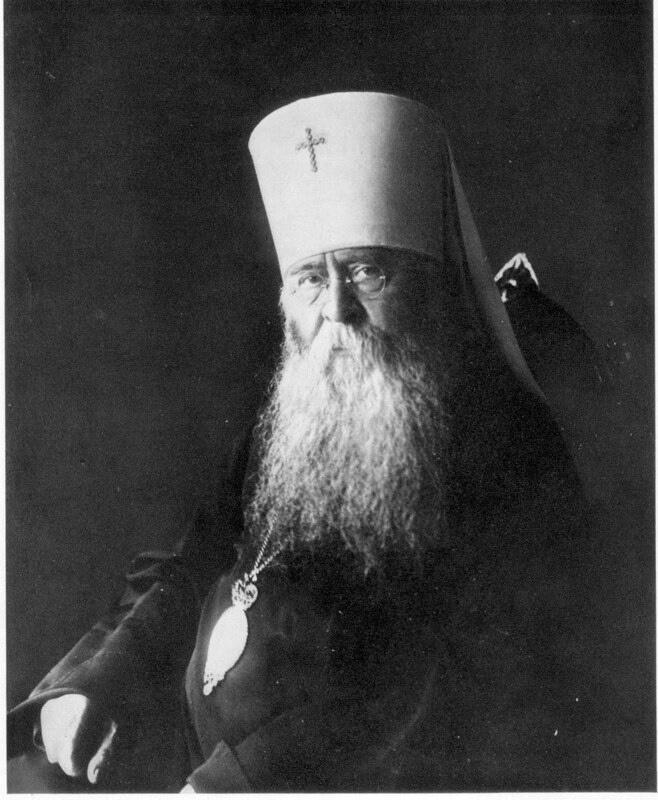 1921: Archbishop Tikhon (Belavin) was elected Patriarch of Moscow (+1925). 1922: The Alcuin Club in England printed the Holy Synod’s Commission report in English. 1927: On February 2nd, the Synod of Bishops of the Russian Orthodox Church in America authorised a Western missionary outreach. 1929: The Russian Fraternity of Saint Irenee in France (headed by Vladimir Lossky and Evgraf Kovalevsky) acting under metropolitical guidance, celebrated the Western Rite in a Parish church for the first time. 1934: Saint John of Shanghai was consecrated by Metropolitan Anthony (Khrapovitsky) First Hierarch of the Russian Orthodox Church Outside of Russia. 1936: Under the terms of a Moscow Ukase, the Western Orthodox Church in France, was set up, headed by Fr. Eugraph (Kovalevsky). A group of Old Roman Catholics led by Louis Charles Winnaert formed the original core membership of this Western Rite national Church. 1944: Fr. Denis (Chambault) professed as a Benedictine within the Moscow Patriarchate in Paris. He founded the Saint-Denis & Saint-Seraphim de Sarov Priory in rue d’Alleray. 1947 Fr. Gregorio Baccolini, a Benedictine monk was received in France. He set up a small Orthodox Benedictine house in Rome. 1953: Bishop Alexander (Turner) and three parishes received as Western Rite by Metropolitan Anthony (Bashir) of the Antiochian Archdiocese with Alexander Turner becoming an Archpriest..
1958: Archbishop (Saint) John (Maximovitch) of Paris took over direction of the Western Orthodox Church in France, (l’Eglise Catolique et Orthodoxe de France – ECOF) setting up a Western Rite seminary and Ordaining clergy. He authorised the use of the Liturgy of Saint Germanus. 1958: The Patriarchate of Antioch adopted the provisions of the Russian Holy Synods of 1879 and 1907 and instructed the American Archdiocese to follow them. 1960: The ROCOR yearbook published the the text of the Western Rite as auithorised by the Holy Synod of Russia in 1869. Archbishop Saint John (Maximovitch) celebrated the Western Rite at the Cathedral of the Orthodox Church of France in Paris. 1961: The Western Rite Vicariate was created within the Antiochian Metropolitanate of North America. Fr. Alexander Turner became the first Dean of the Vicariate. 1962: In the United States, the Moscow Patriarchate Bishop Dositheus received the Monastery of Our Lady of Mount Royal and blessed it to the Western Rite. 1965: Archbishop John (Maximovitch) Russian Orthodox Church Outside of Russia, having been translated to San Francisco, consecrated Fr. Eugraph Kovalevsky as Bishop Jean-Nectaire, of the Diocese of Saint-Denys for the Orthodox Church of France. 1966-72: After the repose of Archbishop John of San Francisco, some elements of ROCOR immediately set about undoing much of his work, including l’Eglise Catolique et Orthodoxe de France (ECOF). Being abandoned in this manner by ROCOR, it was taken over by the Patriarchate of Romania with statutes and declarations issued in 1972 by Metropolitan Nicholas. 1972: Moscow Patriarchate Metropolitan Anthony of Sourozh and Archbishop Alexis celebrated the Western Rite Liturgy in a parish in Italy. 1975: In the United States, the ROCOR Archbishop Nikon received the Monastery of Our Lady of Mount Royal and blessed it to the Western Rite. Saint Michael’s Anglican Parish, Whittier California was received into Orthodoxy (AWRV) as Western Rite – the first Anglican parish to be so received. 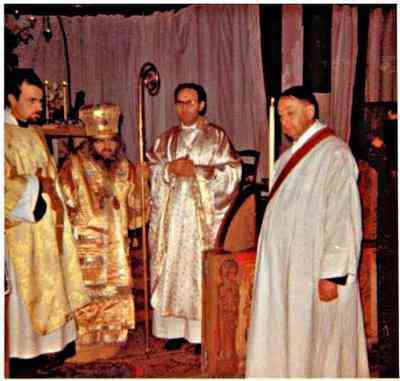 1993: Bishop Hilarion (Kapral) of Manhattan ROCOR authorised the establishment of the Christ the Saviour Monastery in Providence Rhode Island and blessed it to the Western Rite. 1994 Saint Petroc Monastery was placed under the personal direction of His Holiness, Patriarch Ignatius IV of Antioch. 1997: Archbishop Hilarion (Kapral) of Sydney ROCOR blessed Saint Petroc Monastery in Cascades to the Western Rite and directed it to act in a missionary role, setting up Monastery missions using the Western Rite. 1998: With the blessing of Archbishop Hilarion, Saint Petroc Monastery proceeded with the task of applying the instructions in the 1907 report of the Commission of the Holy Synod of Russia and producing a complete Western Rite Prayer Book including the Divine Liturgy, the Offices, the rites of Baptism, Matrimony, Burial, Visitation of the Sick, Divine Offices, Great Litany, Rites of Holy Week, Liturgical Reception of a Bishop, Blessing of Water, Dedication of Objects, Blessing of a House, Grace Before Meals and other Prayers etc. The basis of the Book being the Sarum Missal which had its roots in the pre-Schism Church in the British Isles. 2001: With the blessing of Archbishop Hilarion, the Superior of Saint Petroc Monastery visited l’Eglise Catolique et Orthodoxe de France and after reviewing its operations and the actions of its bishop, and conferring with all parties, he advised Bishop Germain to resign immediately and submit himself to the discipline of the Church. The bishop refused. The Patriarchate of Romania issued a letter deposing the bishop. Hieromonk Michael submitted a written report to Archbishop Hilarion for the Synod, particularly discussing the faithful Orthodox clergy and people who had dissociated themselves from the deposed bishop. The Saint Dunstan Psalter produced by the Lancelot Andrewes Press became available for use as a Western Rite Orthodox Psalter. 2002: The Saint Ambrose Hymnal produced by the AWRV was authorised for use. The completed Saint Colman Prayer Book submitted to Archbishop Hilarion. Archbishop Simon (Ichounine) Russian Orthodox Archbishop of Belgium, authorised the Western Liturgy of Saint John the Divine (Stowe Missal) to be used in the vernacular in the ROC monastery at Pervijze. 2003: The Saint Colman Prayer Book produced by Saint Petroc Monastery was authorised for use by Archbishop Hilarion of Sydney. 2006: The Saint Colman Prayer Book permitted for use in the ROCOR Diocese of Chicago. After two years of guidance by Saint Petroc Monastery, and others, the Anglican bishop Robert Waggener converted to Orthodoxy, was Baptised, Chrismated, and subsequently Ordained Sub Deacon, Deacon and Priest by Bishop Basil (Essey). He was assigned to run a Western Rite parish of people who converted with him. 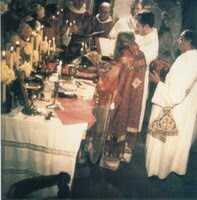 2007: The centenary of the decision of the Holy Synod of Russia to permit the adaption of the English services for use by Orthodox people was celebrated at St. Mary’s, Capel-le-Ferne and as an hierarchical Solemn High Mass at St. Mary’s, Waverley, using the Divine Liturgy of the English Rite from the Saint Colman Prayer Book. 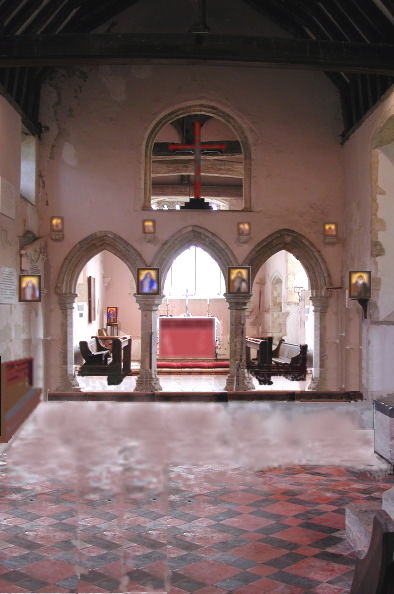 2009: The Primate of ROCOR (Archbishop Hilarion) approved the Saint Eanswythe Mission in Bournemouth to be the first Western Rite mission in England, under his direct control. Fr. Michael (Wood) was placed in charge. After consultation with the Superior of Saint Petroc Monastery, Anglican bishop Alastair Price converted to Orthodoxy (ROCOR). 2010: The Primate of ROCOR brought ten former Anglican/Roman parishes with their clergy into ROCOR as WRITE. The Primate issued a Decree naming the Superior of Saint Petroc Monastery, Fr. 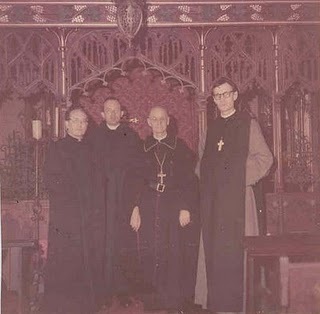 Michael (Wood) as his Assistant for the UK, including Europe, Australia, New Zealand and the Far East for Western Rite, and the Superior of Christminster Monastery Fr. James (Deschene) as his Assistant for North America for Western Rite. 2011: The Hermitage of Saint George took possession of 48 acres of land in New Mexico for the construction of a monastery. 2012: The Primate issued a letter naming Fr. Michael (Wood) (Abbot of Saint Petroc Monastery) as in charge of Western Rite missions in his Diocese. 2014 Metropolitan Hilarion gives his formal blessing and instructions in writing to Fr Michael (Wood) for the establishment of Saint Bride Hermitage temporarily in Edinburgh and intending to move to the western isles of Scotland. The Western Rite has flourished within Orthodoxy for 963 years of the first millennium, 421 years of the second millennium and the whole of the third millennium of Christianity – a total of 1,392 years within the Orthodox Church. In other words, for 70% of its existence, the Orthodox Church has contained the Western Rite within it. Being without the Orthodox Western Rite is an abnormal state for the Orthodox Church. Today, there are over fifty monasteries, parishes, missions and societies within the Churches of Serbia, Romania, Moscow, Antioch, and the Russian Orthodox Church Outside of Russia spread across France, Belgium, Great Britain, Canada, the USA, Australia and New Zealand. Saint John of Shanghai celebrating the Western Rite in Paris in the 1960s. Peace be to you in our Lord Jesus Christ! We are happy to inform you as of 21 March, 1962, the date of your Petition to be received into communion with our Church, that we consider you as provisionally received into the Patriarchal Exarchate of the Russian Orthodox Catholic Church in America. Since you have with Christ-like humility left the “form, manner and conditions” of your reception entirely to our discretion, it now becomes our responsibility to complete this reception and to determine the spiritual and ecclesiastical place of you and your followers among the workers in Christ’s vineyard, the Holy Orthodox Catholic Church. We believe that there should be no delay in receiving you and all your clergy into communion with us, in order that Western Orthodox work may proceed apace in New York City, and that we can be of mutual help to one another. Therefore we would like to begin the reception of those of your clergy nearest to us, continuing until all are received. This reception should be accomplished for the majority of you by Pascha according to the Julian calendar, so that we may concelebrate at that Feast of Feasts. If it is agreeable to you, we would suggest that you consider making your profession by monastic vows, so that action may be initiated with the Sacred Synod for your early advancement to higher status. The Czecho-Slovak Church arose from the withdrawal, in the year 1920, of a certain part of the Czecho-Slovak people from the Roman Catholic Church. This new Church, at its mass-meeting held in Prague on the 8th of January, 1921, rejected both the primacy and the infallibility of the Roman bishops, as well as their religious absolutism and religious mechanism which is ruling the Roman Church.Dogmatically, this new Church stands, according to the decrees of the ecclesiastical mass-meeting held January 8th, 1921, upon the foundation of the Holy Scriptures, the Nicene Creed, and the Seven Oecumenical Councils. This decree was reaffirmed at the ecclesiastical meeting in Prague, held August 28th, 1921. At this meeting it was also declared that the name of the new Church shall be “The Czecho-Slovak Orthodox Church.” Further, it was declared that the Church desires to be affiliated with the Eastern Orthodox Churches. In accordance with these basic decisions, the first Bishop [Gorazd Pavlik] was consecrated at the hands of the Patriarch of the Serbian Orthodox Church at a session of the Holy Synod of that Church held in Belgrade, September 25th, 1921.The Czecho-Slovak Orthodox Church defines its own liturgy and orders within the limits of autonomy, best befitting the mentality of the Western Europeans. Thus the Czecho-Slovak Orthodox Church is half-way between the Eastern Orthodox Churches, with whose dogmas it fundamentally agrees, and the Western Episcopal Churches, with which it shares common practices, namely, the Missal or Liturgy in the language of the people, a common confession, and freedom of the clergy to marry.The spiritual phase of the Czecho-Slovak Orthodox Church is apparent in the awakening of the great masses of the people to a religious life, large attendances at the Divine Services as well as at the Holy Communion, diligent reading of the Holy Scriptures, the moral transformation of their daily life, the cultivation of brotherly love and cheerful sacrifice. There is nothing like it at present in Central and Western Europe. It seems as if the Divine Grace were shed abroad upon the nation [101/102] in an extraordinary manner, after centuries of suffering under the yoke of foreign oppression, both political and spiritual. Time Magazine, Friday, May. 01, 1964If, by chance, a Roman Catholic walked into Sunday worship at the Church of the Divine Wisdom in Mount Vernon, N.Y., he would feel right at home. The priest at the altar would be wearing alb, chasuble, maniple and stole, the familiar Eucharistic vestments of the Western church; the liturgy he celebrated, except for the use of English instead of Latin, would be almost identical with the Roman Mass. But the worshippers at the church are not Roman Catholics, or even High-Church Anglicans; they are members of the little-known Western Rite of the Orthodox Church. Keeping the Mass. The Western Rite is an Orthodox attempt to restore the cultural balance of East and West that existed in their church before Rome —as the East believes — fell away into schism in 1054. In doctrine, Western Orthodox believers follow the bearded patriarchs of Constantinople, Antioch and Moscow, but their way of worship is the Mass rather than the lengthy Divine Liturgies of the East. The Western Rite missal has been purged of Roman “heresies,” such as supererogation, the belief that man can acquire grace through the merits of saints as well as through Christ’s redemption. Communion is given in the form of bread and wine instead of bread alone. The Nicene Creed is recited without a major theological cause of the schism, the filioque clause, thereby adhering to Orthodox teaching that the Holy Spirit proceeds from the Father alone. Founder of the Western Rite was the Rev. Joseph Overbeck, a scholarly German priest who converted to Orthodoxy in 1865. Overbeck had only a handful of followers, but he prepared a revision of the Roman missal and outlined a theological defense of the Western Rite idea that eventually convinced Orthodox church leaders. In 1926, the Orthodox Church of Poland accepted the allegiance of some Polish Catholics, who were allowed to keep the Mass and most of their liturgical customs. In the U.S., most of the Western Rite Orthodox belong to the Syrian Antiochian Archdiocese, which drew up rules in 1958 for a Christian who wanted to join the church. More than Tribal. Western Orthodoxy has been slow to catch on: there are only 3,000 Western Rite Orthodox in about 50 scattered parishes around the world. Even many Eastern Orthodox regard their Western Rite brethren as second-class Christians. But the Rev. William Schneirla, a top-ranking Orthodox theologian from St. Vladimir’s Seminary in New York, argues that the Western Rite “is in some respects the most important recent enterprise of Orthodoxy.” It gives force to Orthodoxy’s claim to be a truly ecumenical church rather than a “tribal religion” and provides “a new instrument for the reawakening missionary thrust of Orthodoxy.” Others believe that the new church may help preserve the faith for future generations of U.S. Orthodox who find themselves unsympathetic to the Old World culture and mentality of their fathers.copyright Time Inc.
HEARD: A Report of the Confraternity of St. Photius of Paris dated 9/22 April of this year, No. 13, in which, among other things it is related that on 18 March of this year the Confraternity received an official letter from Bishop Winnaert, who heads the Catholic Evangelical Church, “with a request to undertake the necessary steps toward uniting his community with the Orthodox Church and to solicit the Moscow Patriarchate for a conclusion on his request. Winnaert presented his Memorandum to the Constantinopolitan Patriarch in 1932. Receiving no reply, he wrote a letter in 1934 and in 1935 he sent the Hieromonk Leo (Lev) Gillet to Constantinople for personal discussions. Metropolitan Gennadius, Secretary of the Patriarchate, presented the following conditions, orally, for the reception of Winnaert and his community: the laity to be received unconditionally; the Western Rite preserved; the priests and deacons (ordained by Winnaert) to be ordained that they might minister to the needs of the newly united parishes; despite Winnaert’s marriage after his consecration, his priestly orders to be recognized, but the question of his episcopal consecration to remain open for an undetermined period of time. Until this question is decided, Winnaert must refrain from celebrating the Liturgy in pontifical as well as priestly rank. He may, however, freely preach and celebrate some minor services. Winnaert submitted to these conditions, in spite of a troubled soul. Nevertheless, Winnaert awaited in vain an official written confirmation of these conditions and was forced to appoint Metropolitan Gennadius a time limit in order that, in the future, not receiving an answer, he could consider the discussions with Constantinople terminated, and himself free to turn in another direction. The time limit expired; no answer was received; and Winnaert, as mentioned above, turned to the Confraternity of St. Photius on 18 March of this year. 1. That the Moscow Patriarchate, in taking under its judgment the matter of Winnaert and his community, cannot overstep the framework of the competency of the Russian Orthodox Church, namely, as merely one of the Regional Churches. This, on the one hand, restricts or narrows down the matter in certain respects – placing before the Patriarchate merely the question of the reception of the petitioners into the bosom of the Russian Regional Church and into the jurisdiction of the Moscow Patriarchate and thus allows us a certain freedom of decision; while on the other hand it leads us to the necessity of adhering to the canons and regulations effective in our Regional Church, not reserving the petitioners any kind of dispensations which require synodal concurrence of all the Regional Orthodox Churches but which has not yet been received. 2. Some diversity in secondary points of doctrine, in the administration of the Sacraments and ecclesiastical discipline, which may be freely tolerated on an inter-Church scale, is naturally subject to restriction when the talk concerns uniting with a Regional, for example, the Russian Church. In particular, hierarchs and clerics, upon entering the ranks of the hierarchy and. clergy of the Russian Church, become teachers not only of their former, but, in general, of the Orthodox Russian flock, and therefore, must adhere to the forms of teaching accepted in the Russian Church. Likewise, also, in the administration of the Sacraments, there should be no such essential divergences as to cause the Russian Orthodox flock to be cautious of resorting to the new clergy for the Sacraments. In general, the newly united community, while preserving its Western peculiarities consecrated by Church antiquity, should not remain something foreign, segregated from the corporate life of the one Body of the Church which received it. 3. Even though opinions were expressed in Russian Orthodox theological studies favoring the recognition of the Utrecht and, in general. of the Old Catholic hierarchv, despite its origin from a single consecrator, nevertheless a conciliar recognition of the Old Catholic hierarchy binding for all the Regional Churches is lacking. This compels the Russian Church to receive those who come to her from Old Catholicism as she receives those coming to her from communities not possessing the Priesthood, i. e., through Chrismation. 4. Also, despite one or another evaluation of Old Catholic orders, the episcopal consecration received by Winnaert from Wedgwood is in itself doubtful. It must be ranked among the “vagrant” (vagans) consecrations, which are now apparently not few in the heterodox world. Wedgwood performed this consecration for a community wandering in the inter-Church expanse and had by no means in mind, through this consecration, to bring this community within the portals of his Church, and Winnaert into the body of his hierarchy. Wedgwood permitted them to go wherever they wished, and to organize their ecclesiastical life as they liked. On the other hand, Winnaert himself turned to Wedgwood for his consecration merely by chance and as an outward token -thinking to find in him a more or less undisputed consecration and, seemingly, not especially caring about the measure of catholicity of Wedgwood’s community in its doctrine or in the whole of its Polity. It seems to follow, at least from Winnaert’s Memorandum, that he did not accept an Anglican consecration, despite his closeness with Bishop Bury, not because of differences with Anglicanism, but because Anglican orders were disputed by the Roman Church. Holy Orders, however, cannot be thought of as something separate from the Church. The Priesthood is the property of the Church, i.e. exists only in her and for her. This is why a postulant, before consecration, takes a vow of fidelity to the Church consecrating him, and to her doctrine. The mystical essence of orders is indissolubly and, one may say, sacramentally united with the canonical regularity of orders. To receive ordination from Wedgwood and not to enter his Church or to leave it at that very time (keeping in mind that the the Wedgwood community in its essence is not under judgment) means leaving with nothing. Such a mechanical (even half materialistic) view of the essence of the Sacrament and such hopeless attempts to acquire Grace -continuing to remain outside of the Church from which it was acquired, is, in fact, characteristic of “vagrant” consecrations. Winnaert compares his consecration to the case when an Orthodox Metropolitan consecrates a bishop for an independent Orthodox Church. There can be no comparison here. In the Orthodox case the concern is, essentially, with the division of one eparchy into two. Even though the separated part received another jurisdiction it still remains flesh and blood of the Mother Church from which it separated. And both the ordaining metropolitan and the bishop ordained by him were and remain among the ranks of the former ecclesiastical hierarchy. In this case, however, Wedgwood and Winnaert met by chance at the consecration and then each went his own way. 5. Winnaert’s entrance into marriage after his consecration undoubtedly transgresses the 26th Canon of the Holy Apostles (Ec. VI:6). Nevertheless, both justice and church economy require us to keep in mind that Winnaert entered into marriage while outside of the Orthodox Church and while wandering in the inter-Church expanse among arbitrary undertakings and general disorder. In such an environment it was easy for any consciousness of the obligatory precepts of the Orthodox Church to become dimmed, and the example of the Anglicans and others could seem an adequate justification for Winnaert also to enter into marriage. To accuse him of evil and premeditated transgression of the Church’s canons would not be right. Therefore, we can apply to Winnaert the exception made by the Ec. VI:3 Canon, according to which, persons entering into marriage after their ordination up until 15 November 691 (i.e., carried away by former examples and having broken the law without evil intent), remain in their rank under the condition that they dissolve their improper marriage and remain without hope of elevation to the next degree of priesthood. Determination of 16 June 1936, No. 75. I. Fr. Winnaert can be recognized only in the rank of presbyter, in which rank he may be received into communion, according to the canons in force in the Russian Church, with, however, the express condition of the dissolution of his improper marriage and without hope of attaining the episcopacy. After fulfilling the designated conditions and his elevation to the rank of archpriest or archimandrite (if he accepts the tonsure), Fr. Winnaert may be left at the head of the united community in the capacity of district dean (or administrator) under the usual diocesan supervision of the Most Reverend prelate ruling the Russian churches in Western Europe. II. The clergy and laity of the united community who possess Confirmation (or Chrismation) recognized by our Church, are received into communion by the third form (through the Sacrament of Penance), while those without it, by the second form (through anointing with Holy Chrism). To enter the Orthodox clergy those of either category must be ordained by an Orthodox bishop. Clerics who have orders recognized by the Church may be received in their existing rank without hindrance. III. In their doctrine of Faith the united community must, without deviation, follow the form of teaching held by the Orthodox Church. Hence the priests of the community must study thoroughly the Orthodox Faith, for example, by means of texts acceptable to the Orthodox Church (Dogmatics, Catechism, “Accurate Exposition”, Confessions, etc.). In instances of doubt directions should be sought form the Diocesan Bishop and such followed. IV. In it Divine Services and, generally, in the liturgical cult, the united community may preserve the Western Rite which it has maintained until now; however, the liturgical texts must be expurgated (even though gradually) of all expressions and thoughts not acceptable to the Orthodox Church. V. The united community receives into it Menology all of the Saints who are venerated by the Eastern Church, but only those of the West who were canonized before the separation of Rome from the Orthodox Church. VI. In the Liturgy it is indispensable that: [a] only leavened bread be used; [b] the Invocation of the Holy Spirit (the Epiclesis) and the Consecration of the Gifts be placed, not before, but after the words of Institution in order to remove all misunderstanding concerning the moment of consecration; [c] the laity be communicated under both kinds concurrently by means of the spoon; [d] the Liturgy be celebrated on a Antimins, consecrated and issued by the Most Reverend prelate ruling the Russian churches in Western Europe, in token of canonical unity with the Orthodox Diocese. VII. The Sacrament of Baptism must be administered by triune immersion and only in view of an exception – by pouring or sprinkling; in Chrismation, Holy Chrism which is received from the Diocesan Bishop must be used; it must be indicated in the rite of Holy Unction that it is given not only in the capacity of “extreme unction” but also for the healing of the souls and bodies of the sick. VIII. Fr. Winnaert, and the others seeking to be united with the Orthodox Church, are to submit a deposition (either individually or from parishes and groups) to the Most Reverend Eleutherius, Metropolitan of Lithuania and Vilna, the ruler of the Russian churches in Western Europe, who, if he himself is unable to be present to perform the Rite of Reception, shall delegate the execution of the same in an Orthodox church of one of the uniting churches, to someone of the clergymen in the Most Reverend Metropolitan’s supervision who is able to perform the service in the French language. IX. The united parishes, using the Western Rite, shall bear the name “Western Orthodox”. X. Those destined to be priest, deacons and minor clerics for the Western Orthodox parishes shall be subject the established examinations in regard to canonical impediments and as to knowledge of the doctrine of the Faith and church ritual. At their ordination they are to be vested in dress of Western form. When participating, in the future, in Eastern Orthodox Divine Services, they may vest without distinction in either Western or Eastern vestments. The Eastern Orthodox clergy shall do likewise when participating in Western Orthodox Divine Services. XI. All matters concerning not only the reception but he further ecclesiastical organization of the Western Orthodox parishes are delegated to the Archpastoral care and direction of the Most Reverend Metropolitan of Lithuania, and the Diocesan Bishop of the Russian churches in Western Europe. Thereto Ukases shall be sent to the Most Reverend Metropolitan of Lithuania and Vilna for guidance, and to the other Bishops for information. Wherefore is this present Ukase sent to YOUR EMINENCE. English translation by Fr. David Abramtsov and Fr. Peter Krochta.